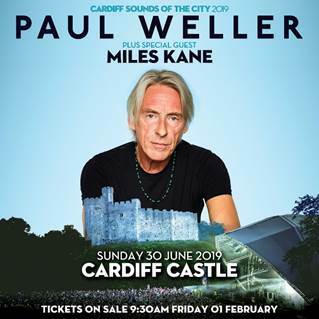 Following the release of his brand new live album “Other Aspects, Live At The Royal Festival Hall” and in the midst of headline shows throughout the summer of 2019, Paul Weller has announced a brand new date at Cardiff Castle for June 30th with support from Miles Kane. NEW DATE ANNOUNCED – 30th June 2019 – Cardiff Castle + special guest Miles Kane. In October 2018, Paul Weller performed 2 extraordinary must-see concerts at The Royal Festival Hall with an orchestra. The second of these shows was recorded / filmed and now sees the light of day as a stand-out live album and DVD released on March 8th.